With eight drawers set low down, and a table top lifted from the top of the drawers, this sofa table offers unique spacing and practical storage space. The beauty of the distressed, multicolored wood and the unique design combines for a wonderfully useful and lovely piece. The Antique Multicolor Collection consists of solid pine with poplar wood door frames. The wood is hand brushed and finished, offering different colors to give an aged, even reclaimed-wood, look. The drawers all have extension glides, and the doors have magnetic catches. 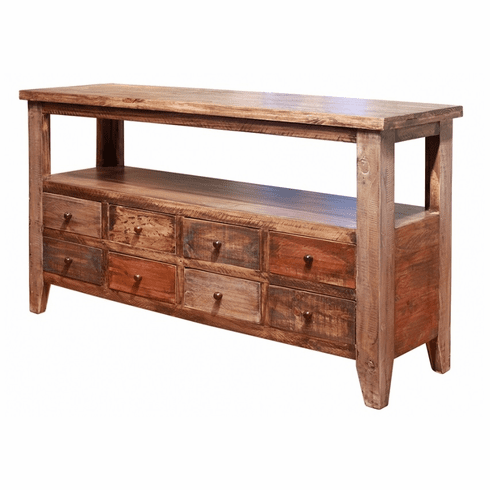 We offer free standard shipping to contiguous 48 states on Artisan Furniture orders over $1500. For orders under $1500 add $150. Please inquire about quotes to Alaska, Hawaii and Canada. Fifty percent deposit required when order is placed, and balance due upon shipment. These imported furniture items are shipped via freight carrier and delivered curbside, though some smaller items can ship UPS or FedEx. Furniture is shipped from one of several warehouses in the USA upon order confirmation. If the items are not in stock, you will be contacted to explore other options. Please inquire about expedited orders or specific shipping needs. See more on Artisans Cabin Furniture.